First of all i am sorry for my English because i can’t speak English. Then there is a little idea for you. Please proofread me. I diged a well in my field and i found the water which has 35 ppt salinity and 24-26 C temperature.i thought that i can cultivate seabass with that water.Then i searched the people who are doing this.They are using wells which can fill their pond in one or two days.Also they have reserve wells for emergency.So they are changing water always and not recirculating the water.That means a lot of wells and powerful pumps but i have limited budget.My well can fill my pond in 5,6 days.What do you think for using solar scrubber at seabass pond.i am planing to grow 3 kg fish in 1 m3.it is too much livestock and needs feed in comparison to an aquarium. I think most important problem is at night and cloudy days.i am afraid that it can reduce the d. oxygen to dangerous levels.i will post my plans but please help me . Give it a try as this is similar to what the Isrealis were trying. They used the waste water to grow macro and micro algae for Abalone/urchins and shrimps respectively. I am hoping to use my screens for feeding my urchin and abalone tank. If you look into how to culture the seabass in a recirculation sytem then you will see what parameters you need to keep an eye on. If you cant find enough information on them then lk into another species which has a similar body shape. The screen will help oxygenate the water but you will need a solids filter before the screen to take out your solids. A small drumfilter or a belt filter are both made easy if you are able. Next thing would be a blower to help stir the water up and help your degassing. The screen will help with this. Use a demand feeder as you'll get less waste with one of these. Not sure though if Sea Bass will respond to one though. Try SRAC Publications for more info. thank you Robert for reply. is the oxygen decreasing when you close the light or is the co2 increasing in the water. A solar scrubber should work a little bit even on cloudy days. Just make it very very big. Will need to be much bigger than what we use for tanks. You have the space outside. Also if you could plant marsh grasses, or other plants, they would help too. Start out with smaller fish. Also maybe you could circulate the water with a windmill or regular pump. Definitely consider a solar turf scrubber. I would also run at least one scrubber thru the night for your oxygen issue. Perhaps you can stagger them since night is usually longer than 8 hrs. Light one to leave six hours into the darkness and light one leaving six hours out of the darkness. You should not start aggressively with as many as you can possibly cram into your setup. Run conservatively and understand the water quality issues, then on a subsequent cycle you can start ratcheting up the load. I would expect the turf screens to be more than adequate aeration. Most of his aeration will come from air being pumped through tubing which has holes punched in it at intervals. Bit like a bubble wall in an aquarium and how it moves water from the top to the bottom. 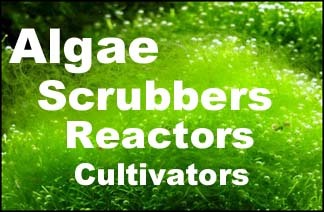 Have a look at us am macro algae bad and find out what you can on a Biodigestor'. They are used in Aquaponics more often now and might be of some use. http://srac.tamu.edu/ Some good reding in there. thank you for your interest i am late because of my sister's child bearing. i want to be first guy who is building ats in commercial area in this forum because Scrubber idea is very reasonable.Algae has a lot of utility and important function in aquaworld without arguing.BUT power is nothing without control. ?f we can't control the algae it can be much mischief.but how can we do it. Using light at night would not be economical and useful because the screens will be very big.Other advices are very good for nutrients but i am worry about dissolved o2 and co2.maybe i must use a different filter for the night and both of them in the day. but it is cooling water that is i don't want. but i think must important subject is the angle of sun light. Zennzzo on the MFK site said that indirect sun light is better than direct sun light.But "Bob the (reef)builder" on the MASA site turned the screen through the sun. You can keep the "river" scrubber running all night; that will be your aeration. And if you get aeration, you will get cooling. Solar verticals are not always two-sided; depends on the angle, and if you use a reflector behind it. Easiest is just a "river" (or two) with large pump. You can't remove the "screen" for cleaning, which will cause some yellowing of the water, but you won't even notice it in a pond. Is there anyway Natapa that you can put your ideas into a drawing format for us to look at and then talk about some of the enviromental factors? This would solve some of the questions and get answers quicker so that you could evaluate them yourself. I have experience in Aquaculture - fish farming of marine fish and fresh water plus experience in abalone culture. Would be great to see you get everything right before you start any construction. That way you build it right from the start and save money in the long term.